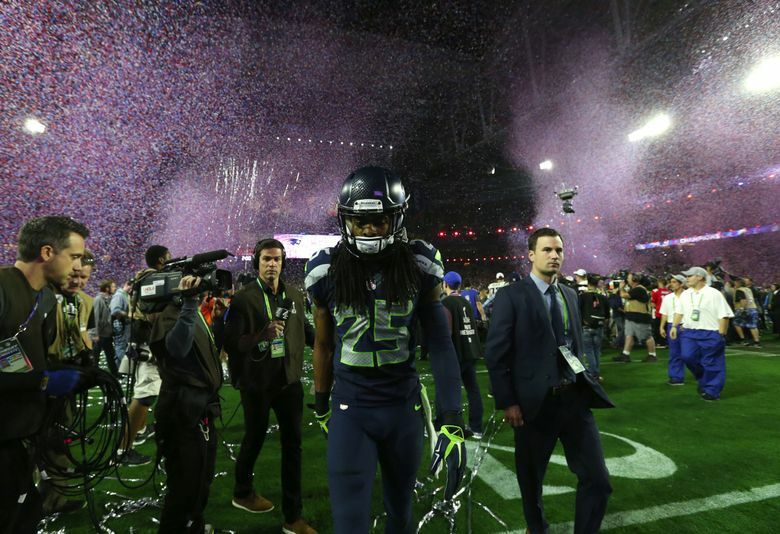 Seahawks corner back Richard Sherman walks off the field after the Seahawks lost to the Patriots in Super Bowl XLIX at University of Phoenix Stadium in Glendale, Arizona on Sunday, February 1, 2015. An ESPN story released Thursday morning reveals Richard Sherman's discontent with the Seahawks dates back to the Super Bowl loss to New England. Why were the Seahawks so publicly dangling Richard Sherman in trade talks this offseason? ESPN’s Seth Wickersham took a really deep dive at answering that question and unveiled a fascinating story revealing a strained dynamic between Sherman, quarterback Russell Wilson and coach Pete Carroll that dates to the ill-fated decision to throw the ball from the 1-yard line in Super Bowl XLIX against the Patriots. The story is titled “Why Richard Sherman can’t let go of Seattle’s Super Bowl loss” and reports that Sherman remains bothered by not only the defeat but Carroll’s refusal not to back down from the thought that it was a good call, as well as reporting that some team members feel the organization is not as hard on Wilson as it is on others (while also revealing something of an overall rift between the offense and defense that grew markedly during last season’s struggles). A few hours after its release, though, Sherman called the story “just a bunch of nonsense from “anonymous” sources. Can never put much gravity of things like that” in a text to SiriusXM NFL Radio. Regardless, the story figures to much-discussed and help set a storyline for the 2017 season one in which Sherman and his actions will be a focus throughout. The beginning of the story details the famous (infamous?) mini-camp practice in 2014 that got the Seahawks penalized for violating no-contact rules (and allowed just one minicamp practice in 2015) featuring a well-publicized fight between Sherman and former receiver Phillip Bates. But the story notes Seattle’s high asking price for Sherman — detailed here as two first-round picks — and that each side eventually got tired of the drama, with Sherman eventually accepting that he will be with the Seahawks in 2017. Not that everyone was impressed by the story. Seahawk Michael Bennett quickly took to Twitter to call it “trash” and was later followed up by Sherman. @RSherman_25 to @SiriusXMNFL: "Its just a bunch of nonsense from "anonymous" sources. Can never put much gravity of things like that"